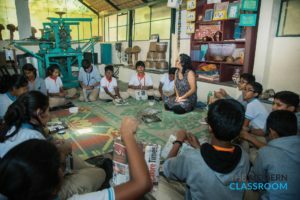 The Modern Classroom recognises that environmental sustainability is the need of the hour and young students will be essential to the reshaping of a new conscious world. In association with Visthar, we curate an exclusive day programme, engrossing students in inclusive development and sustainability. We engage them through this earth-based learning centre, a development locus for biodiversity conservation, with a rich history in transformative education. We provide students with a platform to explore their consciousness while instilling strong mindful behaviours. In their over-stimulated worlds, we aim to establish a balancing contrast, allowing them to tap into their sensory being to stimulate higher consciousness at this tranquil Eco-Sanctuary. What is environmental consciousness? What is sustainable living?